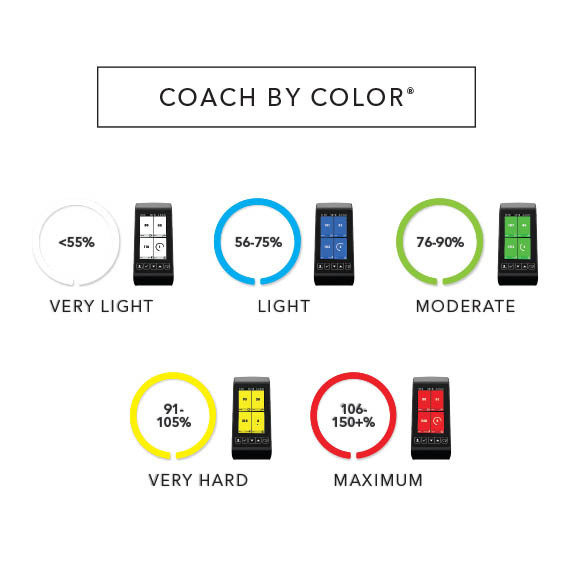 ICG’s Coach By Color® training system delivers real-time, color-coded biofeedback to the user with five color-coded training zones: white, blue, green, yellow and red. These zones can be linked to WattRate® (power) and Functional Threshold Power (FTP), or heart rate and percentage of Heart Rate Max (HRM). FTP represents the workload above which an individual cannot sustain prolonged exercise. 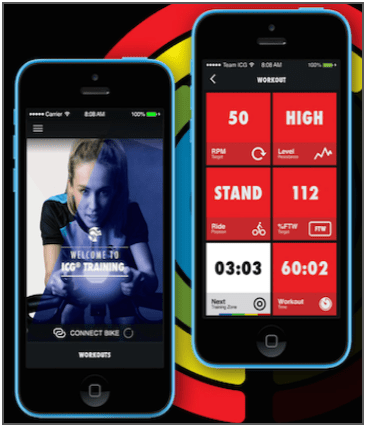 Similar to HRM, once an individual‘s FTP is known, users are assigned the 5 color-coded zones to accurately coach their effort for the best customized results. You can use the predicted FTP (Individual Functional Threshold of Power) which is within 5% accuracy, until you complete an FTP class where you are able to calculate your exact score. Do I have to download the app before class? NO. You may simply input your information on the bike. Do I have to connect my phone to the bike? NO. You can ride without a connected phone or app. Are these classes too difficult for a beginner? NO. Everyone is working off of their own Individual Functional Threshold of Power (FTP) so you are getting an individualized workout tailored to your own capacity. Are these classes challenging for experienced cyclists? YES. Training in your power zones has been proven to improve speed, endurance, and control in both indoor and outdoor cyclists. How to I get into or maintain a color zone? You adjust your cadence (RPM) and resistance (Gear) to reach or maintain your color zone. The color zones are based off of your Individual FTP. How do we use the color zones? Color zones are based on the power you can create with your legs. Your coach will direct the class into different zones as part of your ride. Do I have to take a FTP Class? NO. However, we strongly recommend taking one so that you know your most accurate score. The predicted FTP is within 5% accuracy but knowing your most accurate score will improve your training results. As you progress, it is recommended that you take an FTP class every 4-6 weeks to retest your threshold. When are FTP Classes offered? Classes will be offered each month and noted on the group fitness schedule. You can signup to reserve your bike on Facebook under events. Come ride the new IC7 bikes in one of our Indoor Cycling Group classes. 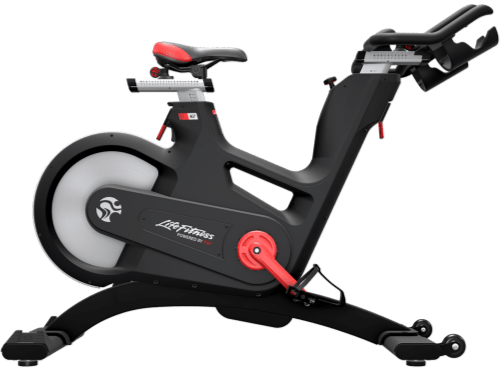 They are the industry gold standard for indoor cycling and offer the smoothest indoor ride. Whether a new beginner or experienced cyclist, using these bikes in the Coach By Color program will result in increased power and endurance. Download the ICG Training App and complete your personal details prior to class. You can use the Predicted FTP (Individual Functional Threshold of Power) score until you complete an FTP class. Download the Intro Sheet Here. Some content Adapted from Life Fitness Website.